The Baghdad Blog, a book based on an online diary written by an Iraqi man about life during the conflict there, is to be made into a film. Media group Intermedia is searching for a scriptwriter to adapt the book by the man, who calls himself Salam Pax. "He's like a Nick Hornby in the middle of a war," Scott Kroopf, chairman of the company's film division, told film industry website ScreenDaily.com. 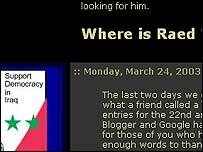 Salam Pax's diary, Dear Raed, became an internet sensation during the Iraq war. Salam Pax, whose real name has never been revealed, spent months writing an often bleakly humorous weblog which detailed the fears and hardships of Iraqi citizens. The diary began as a way for the 29-year-old architectural student to keep in touch with his friend Raed in Jordan. "It was just simple things about what was happening in Baghdad so he could stay in touch with what was happening," he told the BBC's Today programme last year. Salam Pax began a fortnightly column in The Guardian newspaper in May last year.